Are you about to make a pie? Do you have an excess of fruit? How about time....do you have just a few minutes? Let's face it, I love pie, but, I do not always have the time for all the pastry roll out, crimping, filling etc. 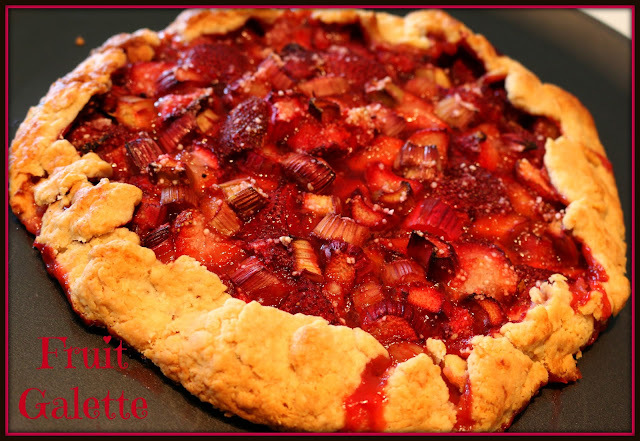 I love a rustic galette! They do not care if they are round or square or any shape for that matter! Requiring less of everything, they come together in about 15 minutes and bake for about 30-45 minutes depending on the fruit. It is kinda fun putting a galette together, very creative! Combine flour and salt in a food processor. Place butter cubes on top of the flour and pulse to combine. Add the ice water and pulse again. Do not overprices; little pieces of butter should be visible. If too soft, wrap and chill for 20 minutes. I made this fruit galette while we were on a family holiday at Lake Chelan . 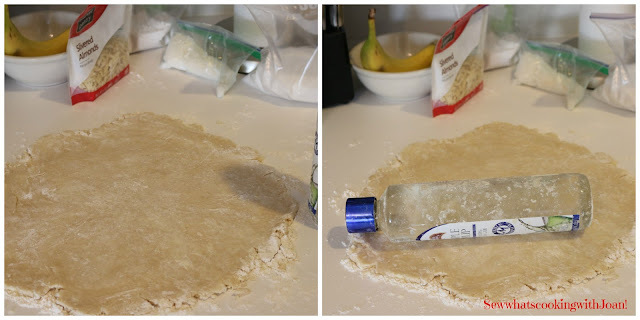 I didn't have a rolling pin so I use a bottle! Between 2 sheets of plastic wrap roll the pastry into a large oval, about 15-16 inches across. Remove the plastic wrap anyplace on a parchment or silat lined baking sheet. Refrigerate while making the filling. Combine the almonds, flour and sugar. Sprinkle mixture over the pastry to within 2 inches of the edges. 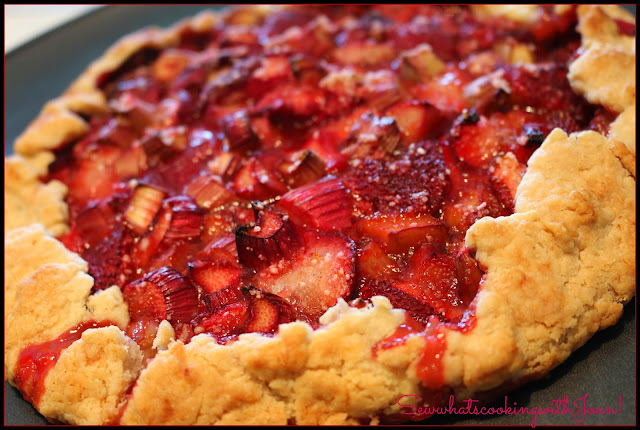 Combine your fruit mixture, I used rhubarb and strawberries, and place over the almond mixture. Fold the edges of the pastry over the fruit, and sprinkle the sugar over the fruit. Then dot with pieces of butter. Bake for 30-45 minutes until fruit is cooked and pastry is browned. If pastry browns before the fruit is soft, just cover with foil. You will love this simplistic free form French pie, try it! It is simple and delicious! No pan to clean up, perfect for a picnic or pot luck. Thank you for commenting! I made this last week with blackberries, it was so easy! It's rustic look is perfect for my picnic table and everyone raved about the flavor. Who would expect such flavor from such a quick and easy recipe~!